What will your Big Lunch look like? In days gone by borrowing a cup of sugar from a neighbour was often the first spark of a new friendship. It was the beginning of long conversations over the garden fence and the first building block of a friendlier, safer and more connected community. But as times change, so do the ways that we build relationships with those around us . And that’s where The Big Lunch comes in; an annual get together on 1 and 2 June where people from across the UK come can together for a few glorious hours to meet, greet, share, swap, sing, plan and laugh with their neighbours. Last year, 40,000 people in Scotland took part. Delivered by Eden Project Communities and supported by The National Lottery Community Fund, The Big Lunch gives you the scope to be as elaborate or as simple as you like. 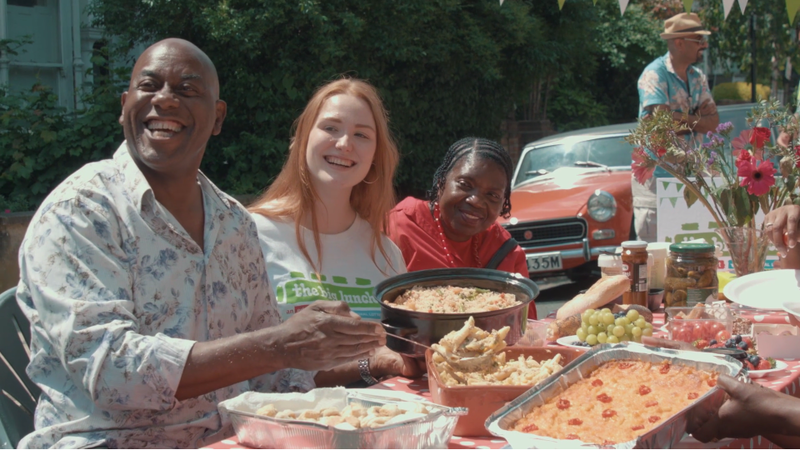 So whether it’s a street party with your neighbours, a lunch at your National Lottery funded project or simply grabbing a blanket and a few sausage rolls in the park, the Big Lunch is what you make it! To give you some food for thought Eden Project Communities are currently running a number of free, informal workshops that will provide support and advice to anyone who’d like to get involved either to plan or take part in a Big Lunch. As well as some handy hints and tips on how to deliver a lunch and how to make it a success, you’ll also meet people in your area who have done it before and you’ll find out all about the Big Lunch pack which gives you the tools and colour to make your event look the part. Workshops are taking place from now until April on the dates below. If you would like to attend simply send us an email. So, come with a neighbour, a friend, or a colleague from your National Lottery funded project – or just come yourself. You might not get a cup of sugar but you’re sure to get lot of inspiration and a fabulous Big Lunch. And of course if you can’t make a workshop but want to be part of the biggest party of the year, you can still download a Big Lunch pack here. ← Community comes first in our celebratory project visits!